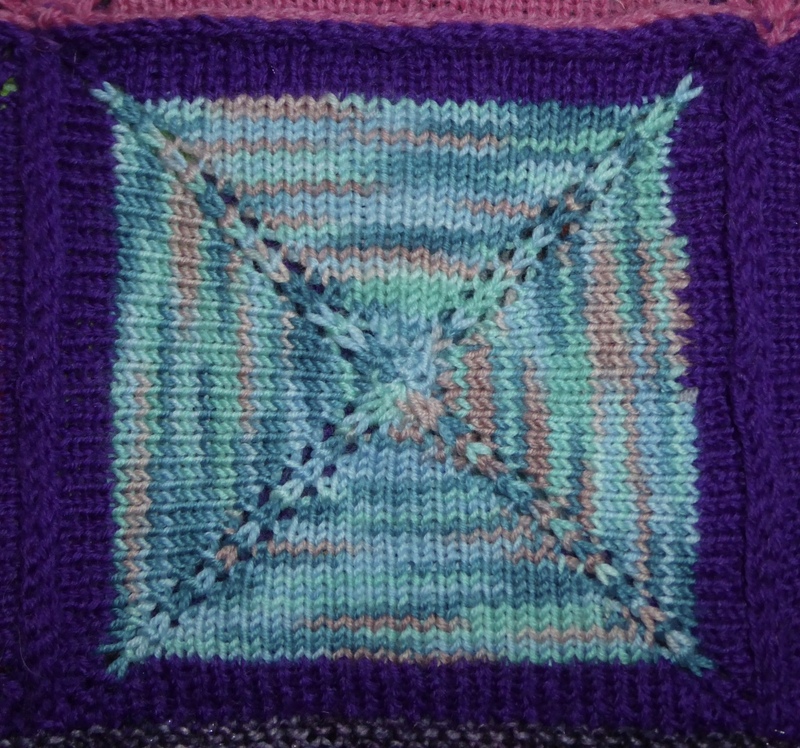 January 2015 saw the birth of my great nephew* and to mark the occasion I knitted a baby sized barnraising blanket. It was well received and I got feedback on how many compliments it had received. 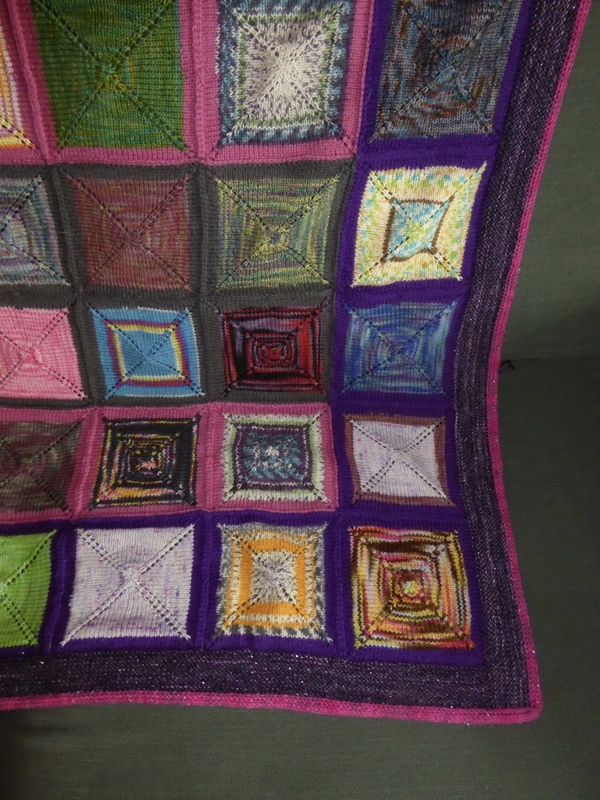 Perhaps the most pleasing, if not a little daunting, was that from my 8 year old niece who asked me in the following October if I could make her a blanket like that one for Christmas. I explained that yes, I would knit her one, but that they take a long time and that it wouldn’t be possible to make it for the coming Christmas, but maybe for the next. Yes, I may overreach myself, but even I knew that even thinking about doing one in 2 months was a crazy idea. 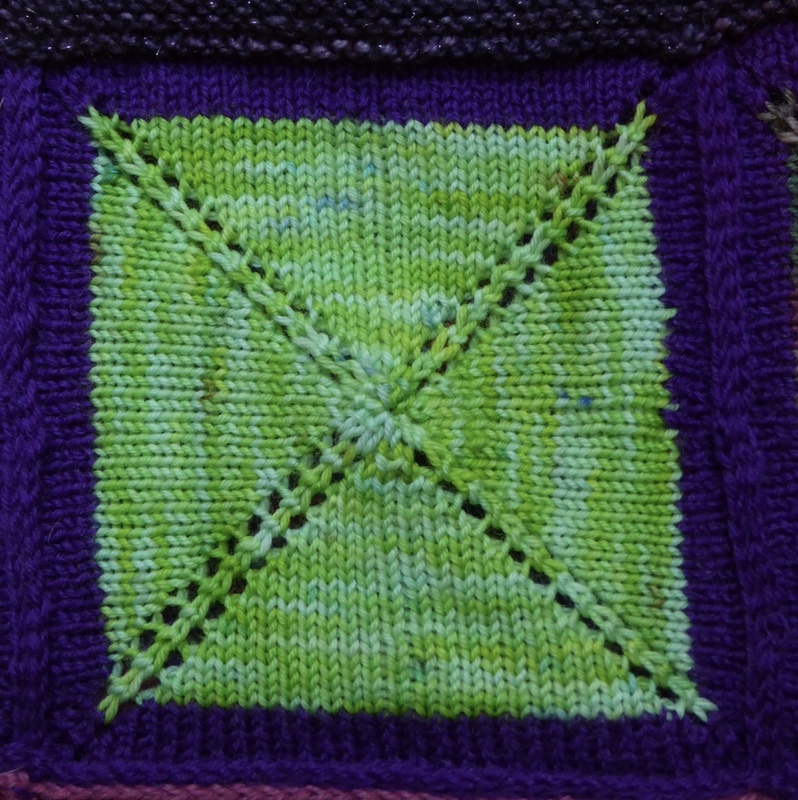 However, what I love about this pattern is that each square is so quick and easy to make. I knew this because by this point I had made 2 baby sized versions and enough squares for a throw for our couch. Initially I worked the square until I had 37sts on each side then worked a solid contrast colour for 6 rows before casting off. For the smaller children’s version I decided to work to 25 stitches on each side and then work the 6 rows in a solid colour. This is what I did for the blanket for my niece. 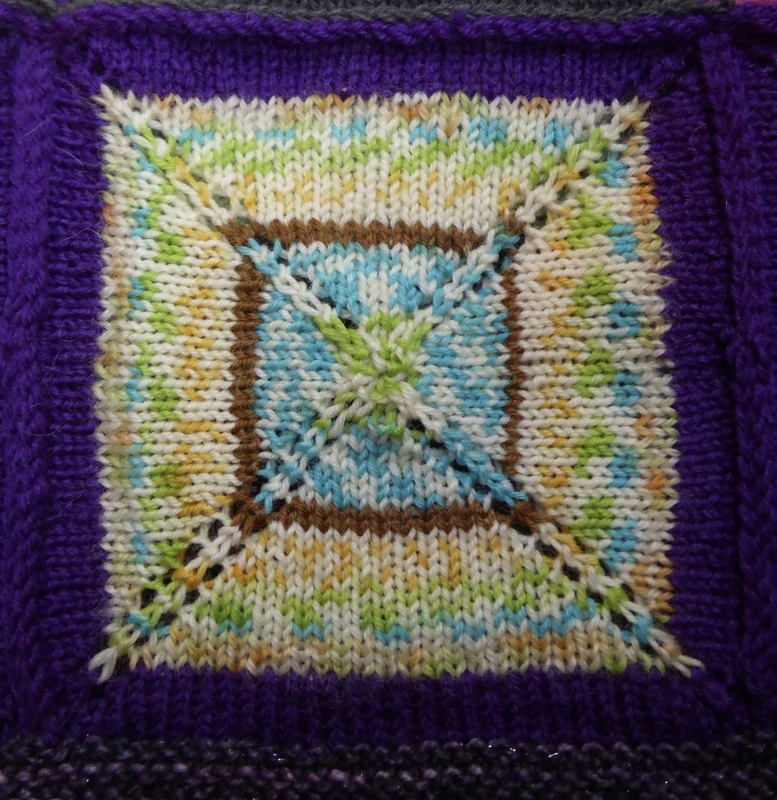 The portability of blanket squares (there’s a theme emerging in these posts, portable projects seem to get done!) 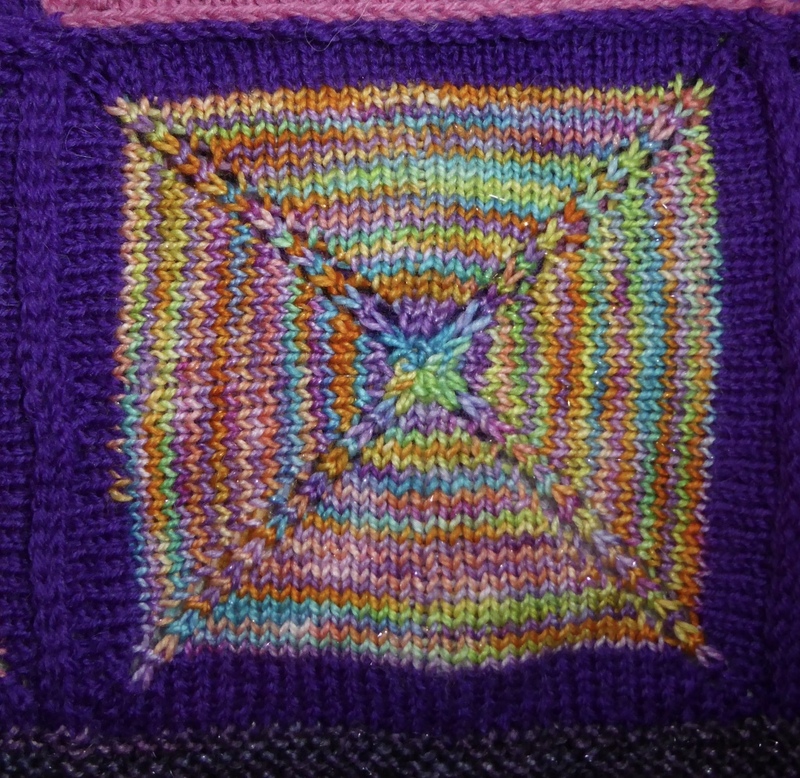 meant that I started knitting the squares last December. In all I made 48 squares finishing them in August and using the Knitgirllls annual Stashdash** event as my incentive to crochet them together. 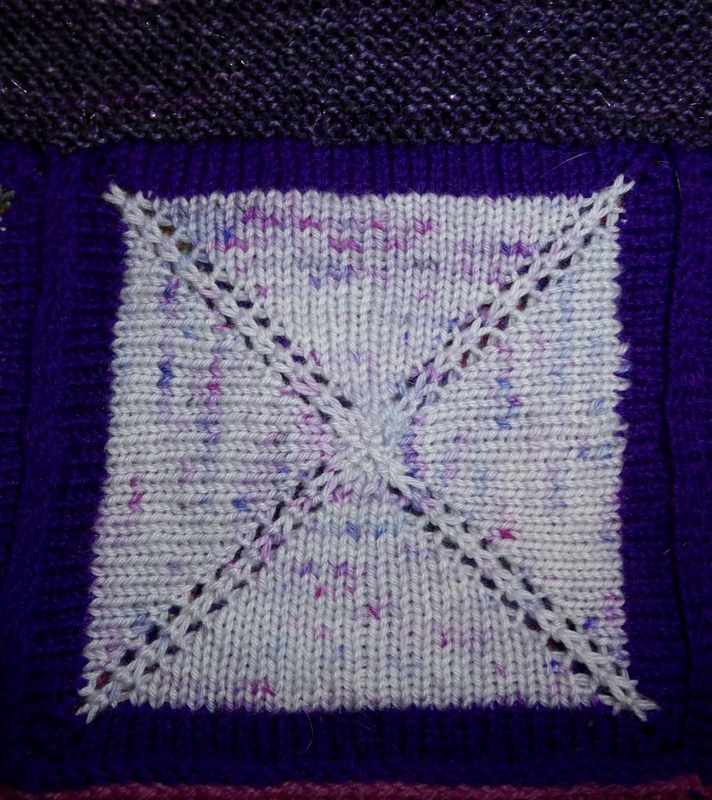 I then used a Mason Dixon log cabin approach to knitting the purple border, i.e. picking up and knitting in garter stitch back and forth along one side, then picking up along the end of this edge and along the next side of the blanket and working that edging before repeating the procedure for each side. Rather than casting off each side as I completed it, I left the stitches live and once all the sides were done I then worked back round doing an I-cord bind off in pink sparkle yarn. The final measurements are 35 x 46 inches or 89 x 117cm which I think will be big enough for snuggling under on the couch. As I made progress I was getting low on sock yarn leftovers and mini skeins so took part in a swap. My swap partner was in Australia and sent me some lovely mini skeins from yarn companies and dyers that were new to me and I really enjoyed knitting them up. From left to right: Bendigo Woollen Mills sock yarn, Miss Click Clack merino nylon sock yarn in Wanton, Miss Click Clack merino nylon in the Shimomura colour way, Morris and Sons Empire merino in Pier. and this Lanituium ex machina in the Kaylee, Go to black out, which also shows the yarn used for the border, an old maiden aunt sparkle yarn in the Derelict Daughter colour way and the pink sparkle I-cord edging in Sparkleduck yarn. 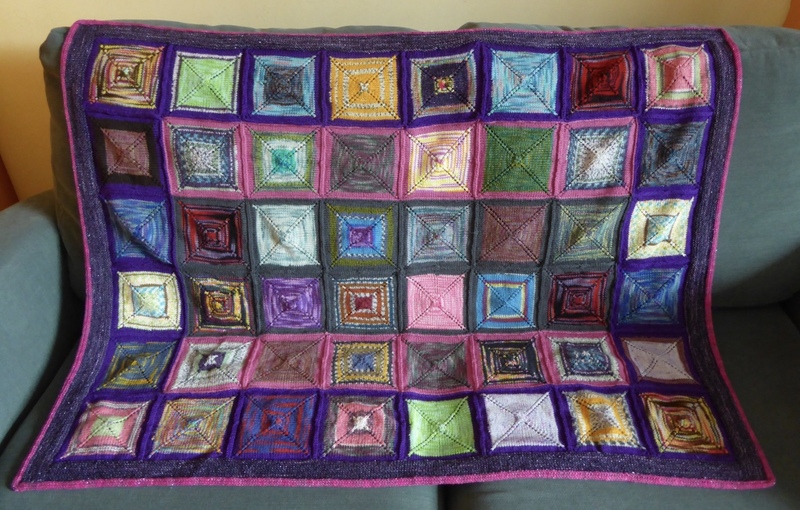 So all in all, whilst daunting, I really enjoyed knitting this blanket, and being organised and starting early meant that it was all fun and no pressure…. *That makes me sound very old indeed, but I’m the youngest sibling and my eldest brother had his children pretty young and so did his son… So actually I’m only a bit old rather than very! ** Stashdash is an annual challenge to complete projects knitting up as much yarn as possible. The full yardage of any project completed during Stashdash can be counted as long as there has been some knitting or crocheting on the project during the event.